This dual TV tuner box has 2 TV tuners built inside. Its design allows users to watch 2 analog TV channels at the same time on one TV screen for entertainment, monitoring, presentation or recording purpose. 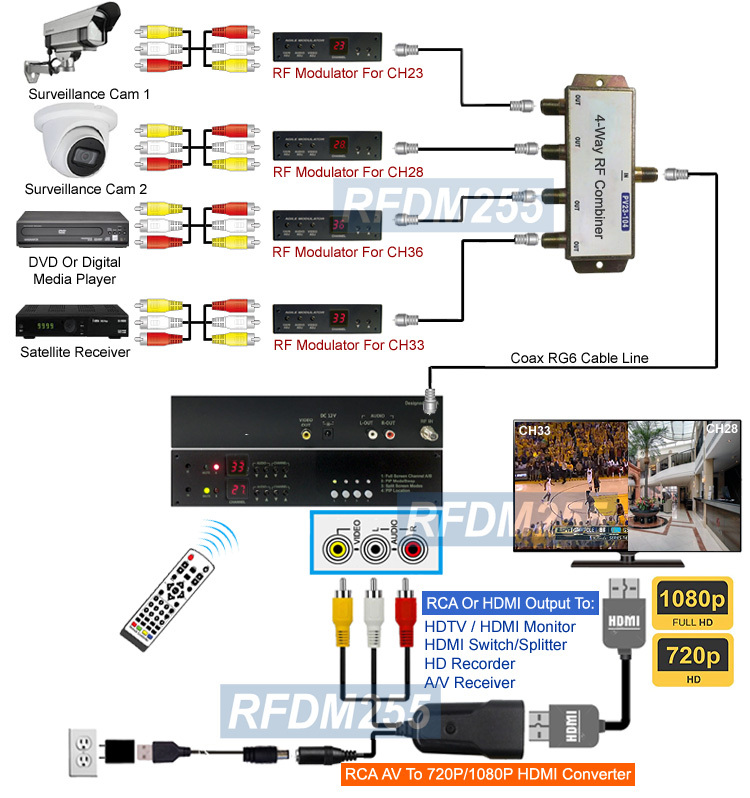 This RF coax to HDMI RCA video demodulator is a professional grade TV channel decoder, designed for converting analog coax TV signals or RF modulated signals into digital HDMI or composite RCA A/V format for display, recording, or further streaming/distribution. The 2nd TV channel window is inserted onto the main TV channel screen in real time as the picture-in-picture presentation. This analog RF coax TV converter can enhance analog TV quality to the ultimate digital format at 1080p o 1920x1080 pixels DVI format with astonishing digital video quality for visual entertainment. Its Picture-In-Picture split screen style and PIP video window position can be controlled by using the IR remote controller or push buttons on the front panel. 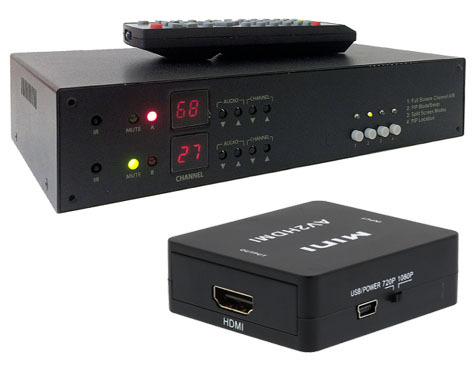 This dual TV tuner can also decode those RF coax TV out from cable outlets, satellite receivers, FTA set top boxes, cable boxes or CCTV camera/DVR systems into composite RCA video audio feeds for display or recording purpose. This dual-channel TV tuner is also a RF coax demodulator for analog modulated RF signal. It has a full-frequency NTSC TV tuner and decodes all standard UHF/VHF TV, CATV channels from RF modulators, cable outlets, cable box, set top box with RF TV out for all countries. This tuner unit supports all standard analog cable TV channels from CH1 to CH139 or aerial VHF/UHF channels from CH2 to CH83. The coax RF demodulator can also decode those TV2 output from satellite receivers like DirecTV, Dish Network or all other satellite set top boxes. This dual TV tuner box is built with 2 TV tuner modules and provides dual-channel frame synchronized output. 2 TV channels will be decoded and synchronized accurately so the mixed video output can be displayed simultaneously for smooth and sharp pictures. A fast TV window swap button is also provided for fast switching between main TV channel screen and PIP screen. 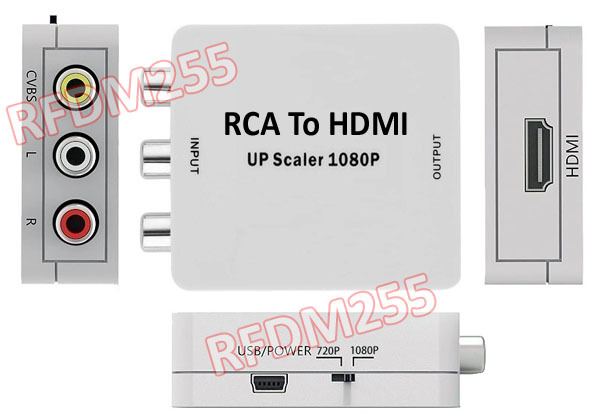 This TV tuner module is able to convert the RF coaxial cable signals to up to 1080p HDMI output or 1920x1080-pixel DVI signal through using the HDMI scaler included in the package. This coax demodulator can be an external TV tuner module for those video monitors with no RF coax inputs. It is also a great TV tuner module for projectors, DVR systems or all other video equipments that do not have RF coax inputs. This dual TV tuner can also serve as RF coax demodulator for decoding those custom-made cable TV channels systems. Customers can use multiple RF modulators for converting the video outputs from individual video equipments into multiple custom-made analog TV channels and combined them into one coax cable run for further distribution between buildings, campus, etc. The 2-TV channel split screen TV video processor can display 2 TV channels in various styles of split-screen views for presentation. Main TV screen and the sub TV screen can be exchanged instantly by simply pressing the swap button on the front panel or IR remote. This hotkey function is designed to provide fast switching between the main channel and the sub video channel. This TV tuner will memorize users' current selection in the system buffer once adjusted. The last-minute PIP screen mode and TV channels will be displayed right away in the same configuration after power cycling or power outage. Premium dual TV tuner with RCA output or HDMI output. Watch 2 analog TV channels at the same time through its split-screen feature. Professional RF coax to HDMI RCA video demodulator for NSTC RF coax signals coming from cable outlets or cable boxes/satellite receivers with TV out or modulated surveillance systems. Support HD and SD video output resolutions at 1080p, 720p, 1920x1080 pixels, 1280x720 pixels and 720�480 pixels. 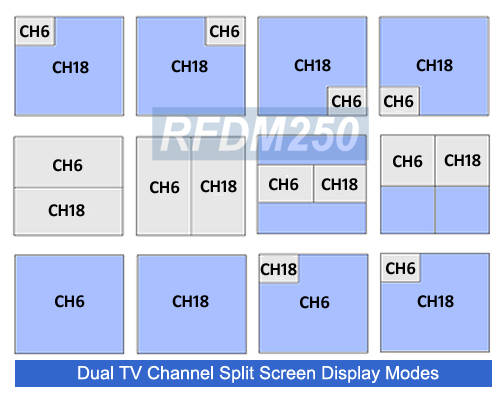 2 TV channels can be presented on TV screen in 9 different split screen modes. 9 selectable PIP mode for 2 TV channels or full-screen mode. 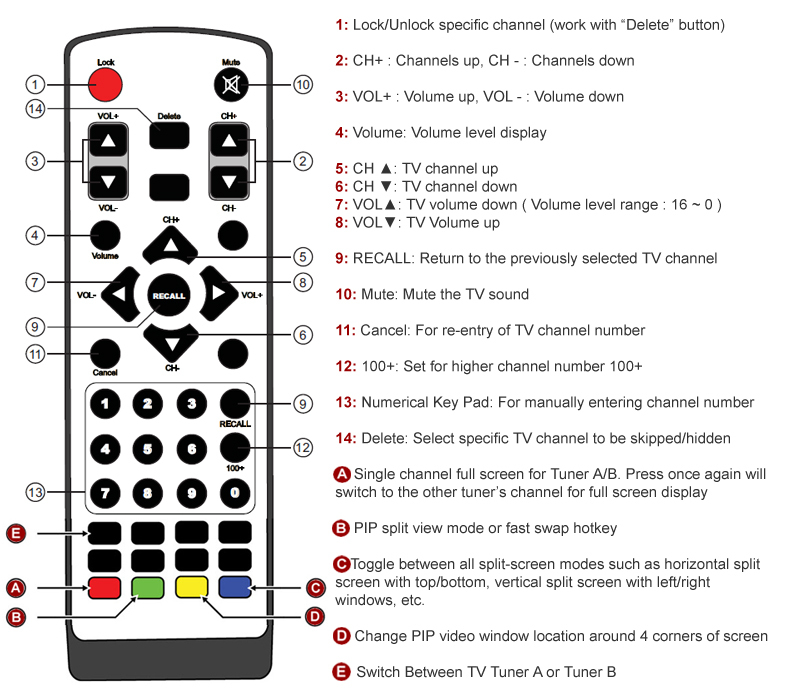 Fast TV channel swap between main TV channel and the PIP channel via IR remote or manual push button. Featured with dual-channel frame synchronizer for smooth video output with sharp and clear picture quality. The current screen mode and TV channel will be memorized after the power-off. Full CATV and aerial UHF/VHF channel frequency support. Perfect for existing modulated camera channels and works with quad video processors, multiplexers, and DVR's. Users have the option to remove the unwanted TV channels from the reception for parental control or other purposes. The deleted channel can be skipped when flipping channel up/down button and can always be added back if needed. Supports last channel memory after power-off or power outage. This coax video demodulator will stay tuned to the last TV channel and the last split-screen mode after being powered off manually or power outage event. Multiple units can be connected with video multiplexer together. This RF demodulator can also be combined with RF modulator for use as a video/audio over coax cable extender kit for many purposes such as CCTV surveillance, multimedia center, etc.